November is not just a month when you aren’t supposed to shave, it is also adoption awareness month. There have been many commentaries made by adoptees on this topic on social media. So, I thought I might lend my voice, as well. It’s a loaded question. I don’t exactly know how it feels to not be adopted. I assume people who always lived with their natural families know the feeling of “kin” or at least know where they come from. I guess… I would assume natural families have this bond with one another that adoptees are missing. I assume natural families are steeped in history and can say, “I am this! I am a part of this family and I have pride, RAWWRR!” (or something like that), while people like me [an adoptee from an infant adoption] are over here going, “well…um… I guess I’m from Mars”. In fact, when I was a kid, I used to joke that I was an alien. I didn’t know where I came from- and I was DEFINITELY not like anybody I lived with. Now that I look back at that, I realize that was not joking. I was trying to make sense of my surroundings, and why I couldn’t form a healthy bond with anyone in my family. That’s right! Bonding is HARD! When you have been rejected by the people you were supposed to have an everlasting bond with, you feel damaged. You feel not up to par, like you ruined them just by existing, and that you are used goods- forced to live a life where you search and search for your faults that must have been so prevalent to them at such a young age that it made them not want anything to do with you. Many waking moments are spent trying to justify why you are allowed to breathe, and waiting for the others in your life to see this primal flaw in you that made the parents of your origin think you weren’t worth keeping. And while this internal battle is going on, your logical self knows that your family of origin was probably just doing what they thought was best. They probably viewed giving you up as a kindness and a sacrifice of love. Oh, the internal conflict!! 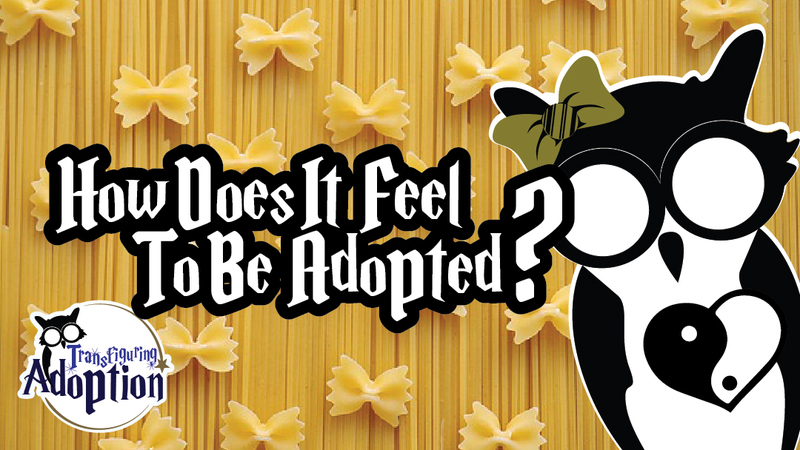 What does it feel like to be adopted? It feels like you’re being quartered by horses named Rejection, Anger, Sadness, and Shame. You are pulled in every which direction by them and you have to stay strong and keep your pieces all together in the center, lest you be ripped apart forever and even if you can find all of your parts, you can never be put back together in a way that makes you recognizable. After all, “All the king’s horses and all the king’s men couldn’t put Humpty back together again”. And all this time, while you are being ripped apart, you are grateful, as well? Being adopted is like being a yin-yang. Darkness and light on each side, with a bit of the other mixed in. You feel extremely grateful for the opportunities you have had. The love you have managed to feel, and many of the little things that others forget to appreciate, like the smell of a fresh spring day, the taste of an ice cream cone, the freedom of pretending you can fly when you are swinging at the park. You were a decision away from not being here. You were a decision away from never existing at all. You still have love inside of you, you are still capable of this amazing life, despite all of the ugly. And that, my adopted friends, is the truth you MUST hold onto if you are going to make it in this life. The world can be harsh, your insides can pull you apart just as easily as the outside world can. You are up against odds others cannot even begin to understand, but you, you have made it this far! And if you are reading this, know that my bond is with you. “I am this. I am adopted. I belong to a race of people that knows no colors, no country, no logistics, but is steeped in a rich history of pain and survival against the odds! AND OF THIS I AM PROUD!! and RAWWWRRRR”. I am proud to be with you- because no matter how we were raised or who raised us, we are family, we are community. Let’s make sense of this, and heal from it together. So, how does it feel to be adopted? Its like having a million pieces of you everywhere, it’s like needing to find something strong to hold onto so you don’t fall off the earth. It’s like being miserable to be you, but being happy to be here. So- F-you life, and thank you all at the same time!